When I first started homeschooling twelve years ago there were a handful of methods and styles in which to utilize. We would fall under the category of eclectic, this means we combine a variety of different methods into our homeschooling. Some of the other methods which were acknowledged when we started are as follows, the Charlotte Mason Method approach, classical, unit studies, distance learning, Montessori, Waldorf and unschooling. Recently two other methods have been brought to my attention, I will not say they are new to homeschooling just that I have not heard of them until now. They are delight directed and TJed, for Thomas Jefferson, this one has been of great interest to me. The main reason is that the focus of this method is to teach children how to be great leaders. Considering the fact that our children are our greatest natural resource and the future for this planet it makes sense to arm them for success. I am not necessarily talking about financial success, while this is wonderful there are many individuals who have contributed greatly to our world and country who were not financially well off as the world views it. Conducting research on success recently revealed to me that success is accomplishing what ever it is you set out to do no matter how great or how small. When we achieve goals we have obtained success. The TJed helps caregivers instill these values into young minds. Will I become a TJed method user now? Nope I like being eclectic, but we will be incorporating some of that philosophy into teaching our children. While I have yet to read any of the books found on the USA Patriotism link I will in hopefully the near future. If you have read them please post a comment, or if you utilize the TJed method please do the same. Methods & Styles - A to Z Home's CoolI want to add that this is one of the best resources for new and veteran homeschoolers on the web. While this is linked to the TJed part of the web site delight directed is easily accessible through the utilization of the side bar. 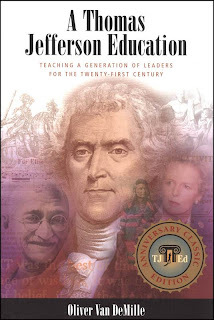 USA Patriotism...USA Store Scroll down to "A Thomas Jefferson Education: Teaching a Generation of Leaders for the 21st Century" by clicking the link it will direct you to Amazon which shows what customers bought who purchased this book geared towards the same topic.